Why mould should not be taken lightly? Tenants have been rating rental properties on Asktenants.co.uk for over a year, along with reviews we ask tenants to complete a small survey which helps us identify key issues tenants are facing. Based on sample data of over thousand properties rated on Asktenants.co.uk a third have mould issues making mould the top issue tenants are facing. Shelter’s report suggests even higher percentage of tenants facing mould issues. Expanding the survey results to over 9 million rental properties in the UK, 3 million rental properties in the UK can have mould issues. What is the cause of mould? Expert comments and Q & A with UK’s leading mould expert. Legal discussion on who is responsible for mould – tenant or landlord? Section 1 What is a mould? Mould is one type of fungus different from plant, animal or bacteria. Just like us, mould needs water and food to grow. Mould thrives on temperature between 5 to 40 celsius & humidity above 60%. The high humidity makes enough moisture available to make surfaces damp enough for mould to grow. Of these life style, is invariably not the reason for mould but a combination of other factors which require identification, repair, drying and then controlled mould removal. Mould is the planet’s clean up system where it is always present and waiting to digest dead cellulose and organic materials. Our homes are made of these materials in the form of wall paper, plasterboard, furniture, clothing even dust which is often dead skin. Different mould compete with each other and bacteria to grow and digest these dead materials. When challenged by other organisms or fungicides they may produce very potent toxins to fight off competitors. Medical products made from mould include “Statins”, antibiotics, and drugs to turn off the immune system typically prior to transplant surgery and these same chemicals may be present in mould affected homes. Mycotoxins are usually only released when specific moulds are under attack in situations such as competition with other moulds or bacteria, and of course drying out or killing mould with fungicide or bleach type products. Penicillium can produce Ochratoxin and is linked specifically to damage of kidneys and liver and depleting the immune system. Trying to kill mould may cause the release of chemicals mycotoxins and no fungicide is likely to neutralize these chemicals. One of the most dangerous mould found in the homes is called ‘black mould’. Its greenish-black gelatinous mould. It is usually slimy because of a wet layer on the top. However if a toxic black mould colony’s water source runs out it can appear dry and powdery. Mould can impact anyone which is evident from this article on daily mail where actress Brittany Murphy’s death linked to fungus in LA mansion. The comments on this article where users share their story about mould will make you realize how big a mistake it is to ignore mould. Typical Health consequence from mould exposure, Itchy eyes, Flu like symptoms, Achy joints, Chronic Fatigue Syndrome, Tingling lips, Skin irritation and rings, Nose and lung bleeds, Headache, Blurred vision, Vertigo. Mould is absolutely everywhere on the planet, but to grow, it needs water. Whether the water comes from rising damp, poor ventilation, dew point condensation or whatever, without moisture mould cannot grow. The next issue is that mould growth inside a building does not necessarily or indeed usually reflect the naturally occurring mould in outside air. Toxic mould species inside a building will invariably be below detection levels outside and is usually capable of producing toxins. With regard to the health effects of mould, the Secretary of State has stated when referring to the Housing Health and Safety Rating System (HHSRS) “Mould is a class 1 hazard and is a carcinogen” This carcinogenic issue is also reflected in various other legislation too. Environmental Health Offices (EHO) will assess mould damage using a logarithmic (sums) to assess visible mould which is of course invisible in the air that you breathe. I have challenged every EHO I have ever met asking how they can assess an invisible hazard by sums when any competent environmental Hygienist will take air and surface samples. Their answer is they have no training, no budget, so if your met with this approach I suggest you contact your MP. Mould is internationally recognized and in British Standards as a potential carcinogen, skin and respiratory sensitizer and asthmagen. It is also recognized that dead mould is perhaps 40 times more hazardous than live mould (WHO) so it makes absolutely no sense to kill it, it must be removed from surfaces and air. It is now also firmly recognized that some individuals are genetically more sensitive to mould exposure and of course the age and medical fitness of all exposed will influence health impact. Q1) Many tenants ask if they should use bleach on mould. What are your thoughts? Definitely not. Bleach is not a fungicide it is a registered cleaner only and bad one at that because it simply kills contamination. British Standards WHO and all international agencies recognize dead mould is 40 times more dangerous than live mould so killing mould is obviously bad if you don’t remove it. It should be remembered that British Standards also state mycelia and mould fragments are allergenic and possibly toxic. Studies have shown that bleach will not kill all mould species and that stress caused to the mould can increase toxicity. Q2) What else can we do to deal with mould? The first issue is to identify the why mould has grown and in all circumstances it will be because a moisture source is available. The following protocols should be followed a) Mould investigation b) Drying, Contamination assessment c) Mould removal d) Decontamination. Q3) Do you do surveys which can tell who is responsible for mould Landlord or Tenants? Are these surveys recognized by councils? Yes, the survey is by www.Buildingforensics.co.uk and is undertaken by a qualified environmental hygienist supported by government approved laboratories. They do not approve any organization that provides evidence against them but they cannot refute impartial evidence which is compliant with British Standards and WHO recommendations and or UK legislation. It should be remembered that mould is a carcinogen and asthmagen and MUST be removed and controlled. Q4) If your survey finds that tenant is not responsible, is the landlord responsible to reimburse cost of survey? I don’t know that is a matter for solicitors. Bottom line is the law governing safety of the tenant Housing Health and Safety Rating System (HHSRS) recognizes the health issues of mould and while the HHSRS only quantifies mould exposure by visible calculation, the regulation recognizes the need for better quantitative assessment where necessary. Currently the Environmental Health Officer will give a landlord 21 days to paint over mould, this does nothing to remove the inhalation hazards which WHO state is perhaps 40 times greater than ingestion. Section 5 What is the legal position, who is responsible for mould tenants or landlord? We have done our research and found useful legal advice by LBC’s resident Barrister Daniel Barnett. Listen to legal advice shared on LBC radio here http://tinyurl.com/gvzykmh it’s the most important 5 minutes you will ever spend if you are a tenant and have mould. 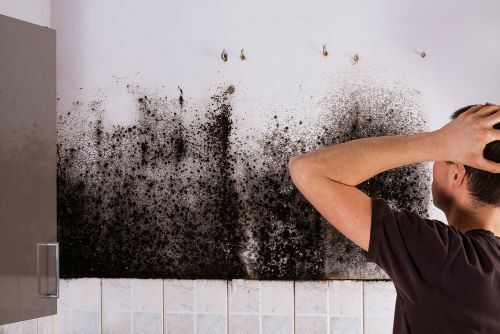 The issue of mould is generally a tricky situation because normally landlords are legally responsible for everything to do with the basic build of the house, including the walls, but the responsibility for damp and mould is slightly different. Landlords are generally responsible for damp if it’s caused by leaky pipes, structural defects or a damp proof course going wrong. The tenant is responsible if it is caused by condensation because of lack of ventilation, like not opening windows or inadequate heating. This is the key point. It’s always going to be very, very difficult to prove whether the mould was caused by inadequate heating or something else without getting an official assessment from a damp expert. If it’s not obvious that the mould was caused by a leak or structural damage, then it’s most likely that the reason is due to the temperature not being adequately controlled by the tenant, consequently the cost of redecorating can be deducted from the tenant’s deposit. Rightly or wrongly so, it’s up to the tenant to prove the cause of the mould, because on the face of it, if there isn’t an obvious leak or any another obvious cause, the most likely explanation is lack of ventilation. That’s the most common cause for mould. If the tenant obtains a written report from a damp expert, stating that the problem isn’t caused by heating or ventilation and it’s actually because of a structural defect, then the landlord will most likely be held responsible. If the tenant disputes the claim and wants to refuse the landlord from using the deposit to resolve the mould issue, the tenant can notify the tenancy deposit scheme in which the deposit is being held. The case will then be assessed by an internal arbitration scheme. But the problem with that is, the absence of evidence will suggest that the most likely cause is ventilation or heating. Hope you found the blog informative. We have invested our time into mould research as you told us in your reviews on Asktenants.co.uk how common this problem is. Some of you have also sent us letters from your GP on how mould in the rented house is impacting health of your children, having been a tenant who lived in a rented house full of mould we could relate to it. Please do keep rating your rental by signing up to our website. Your ratings keep us going!